Things are starting to turn around for Yes. After a poor start off the blocks in this ridiculously competitive telco race, the new contender is looking like it might be able to keep up with the pace. 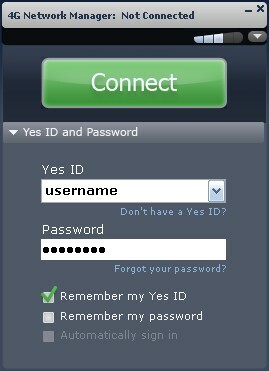 After receiving an email confirmation that our pre-registered account has been activated, we were finally able to log onto the Yes network with our Yes ID. 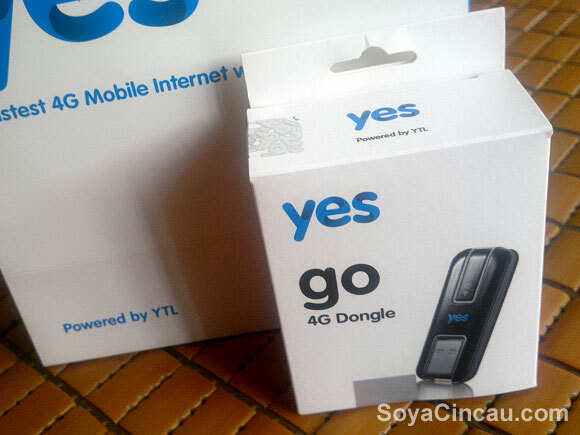 And with that we immediately started on some performance tests of the Yes network and the Yes Go 4G dongle. 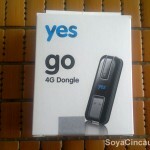 So here it is our first impression of Yes 4G network while using the Yes Go dongle. 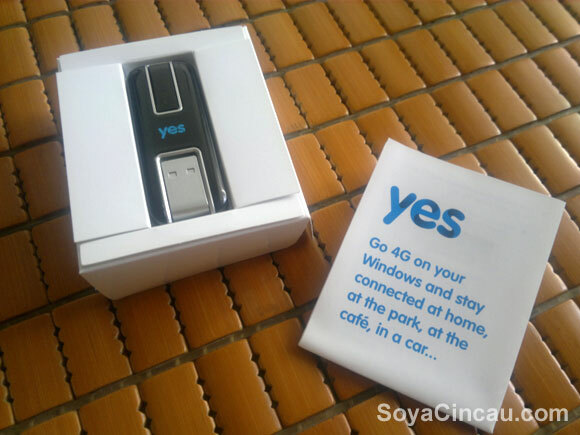 At RM99 with RM100 pre-loaded credit, the Yes Go 4G USB dongle offers the lowest entry point into the Yes 4G network. The Go has drivers for both Windows or Mac but we’ve gotten reports that they are some issues when running the device on a Mac. We like the packaging of the device. It’s simple and uncluttered. 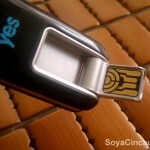 Inside, you get the slim dongle and an installation guide. 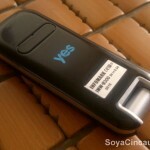 On the device itself, a label behind reveals that the Yes Go is made by Informark — a Korean WiMAX equipment manufacturer — that carries the model IMW-U300. A quick check at the informark site reveals the IMW-U300 Go looks remarkably similar to the IMW-U100 dongle that informark advertises. We’re not sure what the differences are between the two but we will try to find out. Weighing in at 16g, the Go feels very light and judging by its weight alone, you might think that the device is hollow dummy set. This is a good thing considering the fact that you’ll be carrying the Go with you but it doesn’t bode well for quality as it feels rather cheap — simillar to to the original W1GGY. The foldable USB head is stored neatly into the body just like P1’s WiMAX’s older W1GGY and it flips out up to 270 degrees to the back. When compare to the W1GGY, you’ll immediately notice how much smaller the Go is. Forget about comparing it with P1’s so-called Super-W1GGY as it’s plainly obvious that the Go is much, much smaller and doesn’t need a cable or a suction cup. 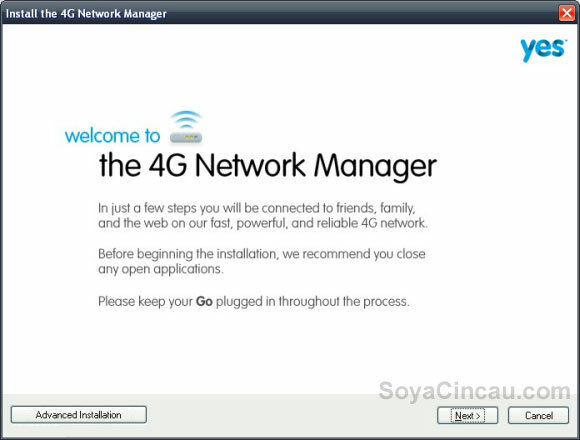 Spec wise, the Go operates on WiMAX at 2.3GHz which is the allocated WiMAX frequency in Malaysia with channel bandwidth of 5MHz, 8.5MHz and 10MHz. 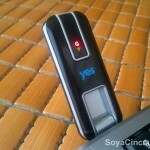 The device has a rated download peak speed of 30Mbps and uplink of 6Mbps. 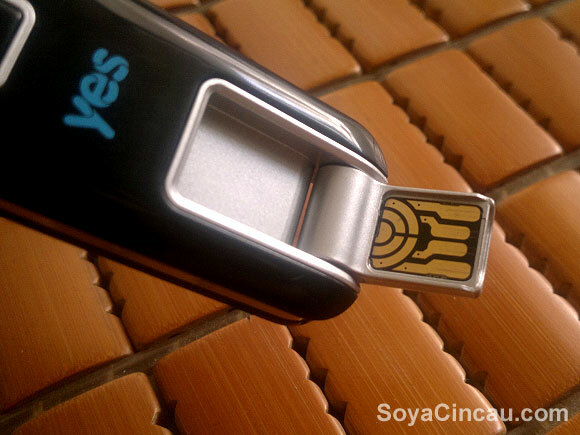 Before you can connect to the Yes network, the USB dongle boots up the set up file of its “4G Network Manager”. 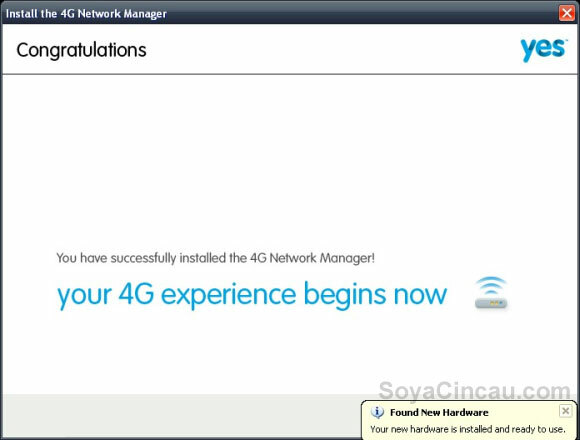 Installation was a breeze, with just four you’re ready to connect. We also like the look and feel of the connection manager but it didn’t have the option for us to look at the signal strength and quality — the RSSI and CINR values (Update 24112010 0107hrs: Turns out you can check the RSSI and CINR values under settings where there’s a tiny button on the top right marked SYSTEM INFO). 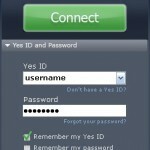 To connect to the Yes network, the Go Network Manager will first search for coverage around your area. If there is coverage, the signal strength will appear on top represented by the number of bars. To proceed, just key in your ID and password then click connect. The whole process from searching and logging in took less than 30 seconds and we’re able to connect to the Internet. 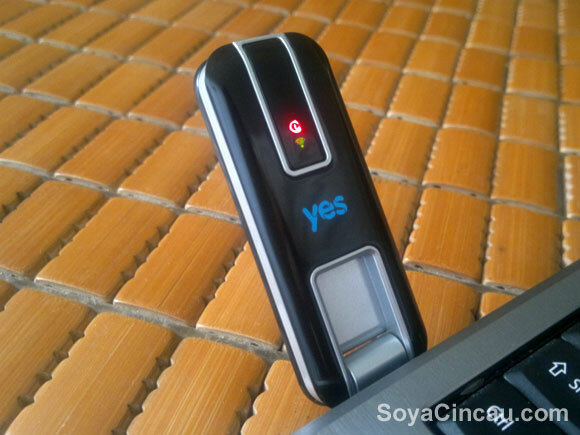 We compared this with the P1 W1GGY and Super-W1GGY and found that the Go, beats both hands down on the speed in which it is able to detect the network and also the speed in which the computer can detect the modem. 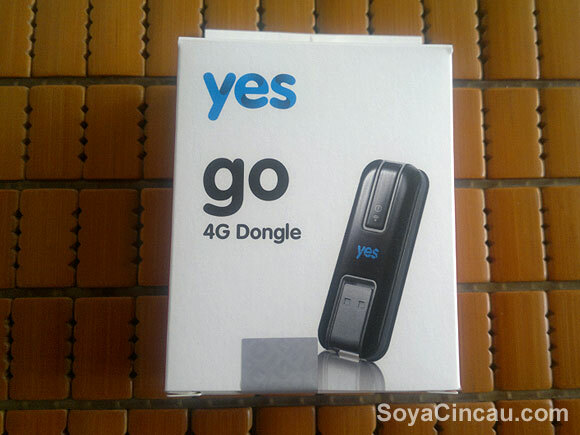 The go does offer speedy connectivity. Just for fun, we also compared the network detection performance of the Go and an MSi WENB. The Go was pretty close to the network detection time of the WENB. Considering that the WENB has a WiMAX chip embedded right on the motherboard itself, the Go’s performance is amazing. If you’re a highly mobile user who needs to send out emails quickly, you’ll appreciate the fast start-up of the Go. We know we did. 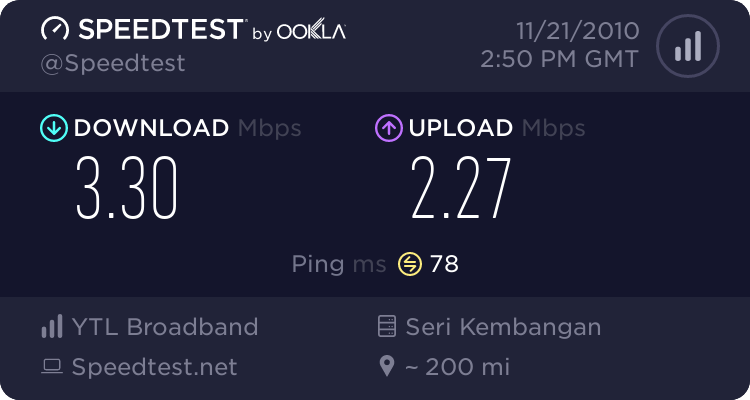 Unfortunately our initial test location (Taman Shamelin Perkasa, Cheras) had very little coverage with the Network Manager showing between 1 – 2 bars in signal strength. This could also be related to the fact that we conducted our tests from the 17th floor of the apartment building that we’re in. Side-by-side with the our W1GGY tested at the same location, we were able to get the same number of bars (between 1 – 2) but we were unable to get connected to the network. Despite the less than optimal network coverage, we proceeded with the test anyway. 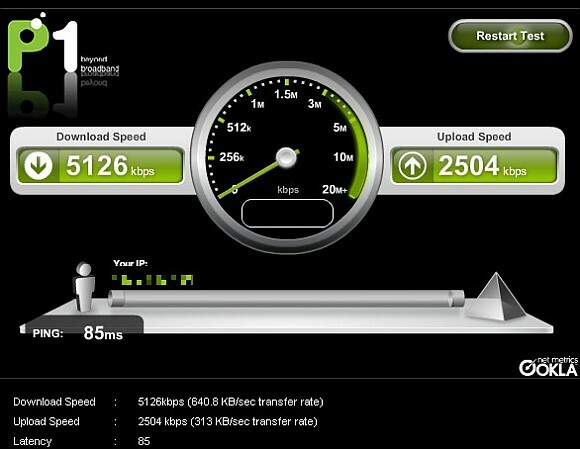 As you can see in the speedtest pictures posted below, the download and upload speeds are pretty impressive. 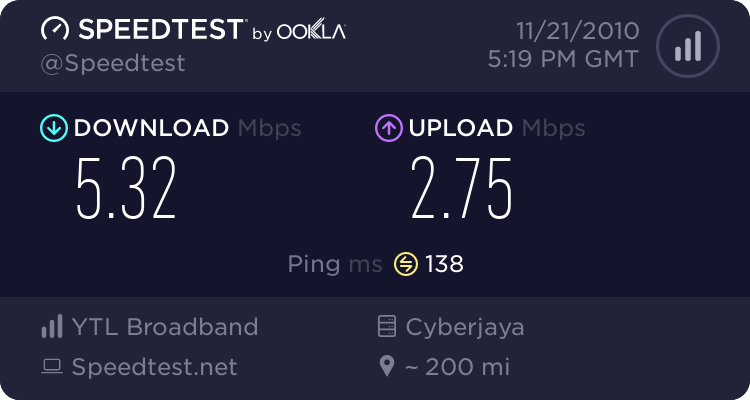 However ping seems to be inconsistent locally with some showing under 100ms while international sites clocked around 300 ms.
We’ve also done speedtest using other ISP’s tools from Maxis, P1 and Streamyx with screenshots at the gallery below. Comparing to other 3G networks, we averaged DiGi at 1Mbps download and 300kbps upload, with U Mobile we got roughly the same speeds. 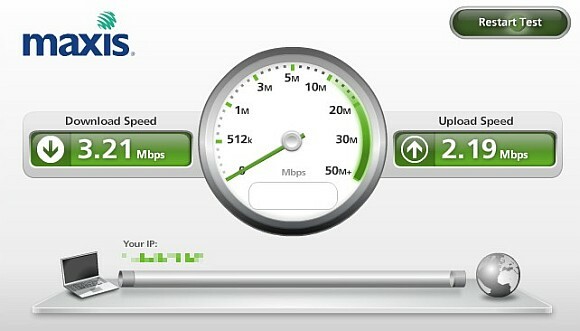 Maxis performance at our location is appalling delivering dial-up speeds. 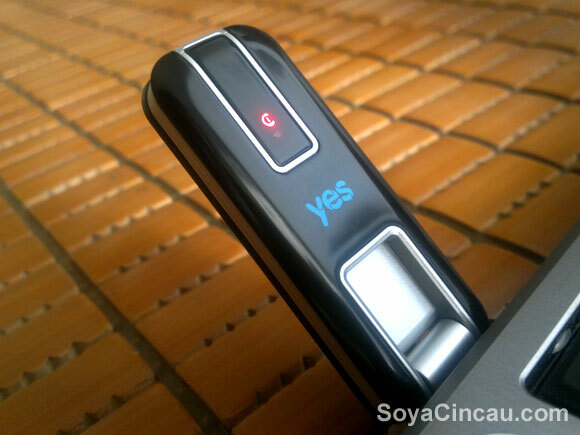 We don’t have a Celcom account to test so weren’t able to compare Yes with that. 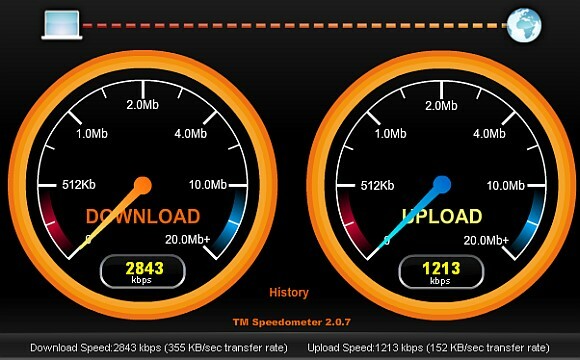 But do bear in mind that this is a virgin network with very little number of users per site, so you should expect these good, solid speed right now. 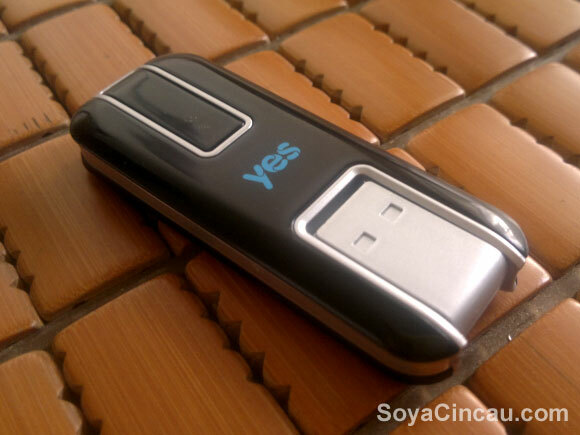 The real test will be if Yes could deliver this consistency at the load increases with the number of subscribers. But having said that and having test other virgin networks before, we can say that these results are amongst some of the more impressive ones we’ve seen. 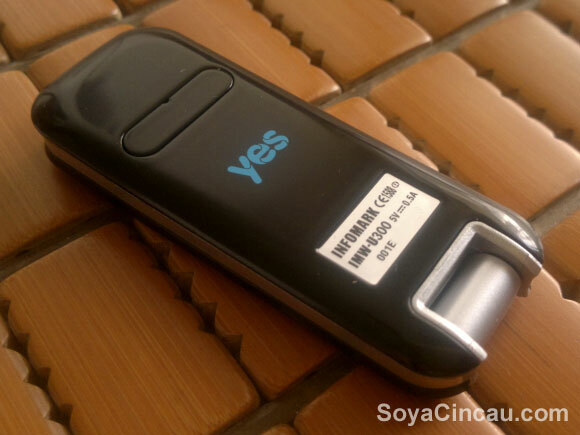 Unlike other operators, Yes never specifically advertised about its speed figures, instead it generalises that subscribers can expect up to 3 – 5 times the speed of 3G. 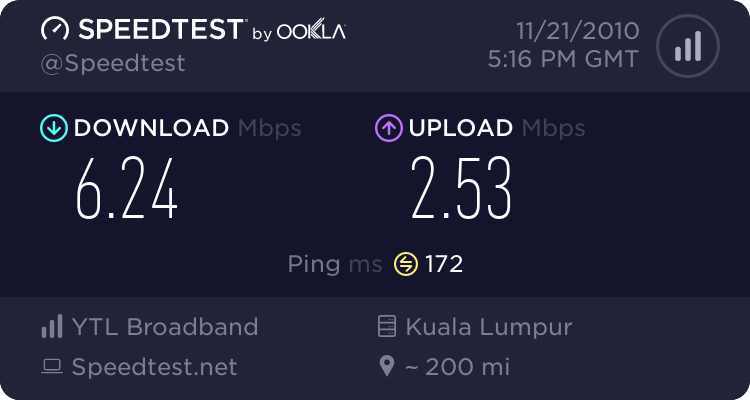 We find that 3Mbps download is roughly three times faster than what normally get on our 3G HSDPA connection at our location. 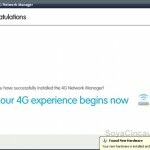 Effectively, the 3 – 5 times faster than 3G claim is substantiated. 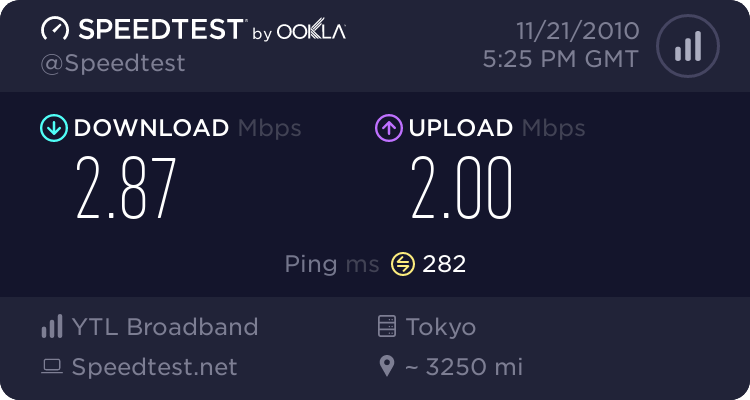 What’s more surprising is the upload speed of 2.75Mbps clocked in the speedtest which definitely is the fastest upload we’ve seen on a mobile broadband. 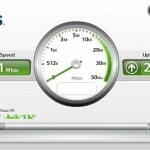 Of course speedtest numbers may not necessary reflect actual usage. So next we tried to do a couple of download test. For a single thread downloads, we got about 150KB/s to 180KB/s on average which we find is pretty decent. 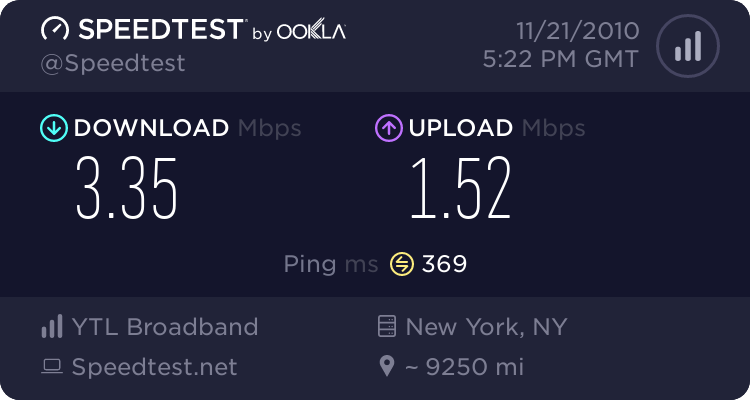 To test out the max download throughput of the Yes network, we did a multi-thread download test and the results were even more impressive. Downloading using FDM started pretty low at 180KB/s but that progressively went up to an average of between 500-600KB/s which equates to a connection speed of just under 5Mbps. Next, we tested video streaming on youtube and that delivers smooth experience free of any buffering even when we bumped up the video to 720p. However when pushed to view 1080p videos, signs of buffering start to appear due to its higher bandwidth requirement. Nevertheless, Yes still delivered impressive speed and consistency. While we’re pretty happy with Yes in terms of its performance, we must once again point out that this is a virgin network with very little load and a small number of users on the network right now. As with almost all networks of this kind, it is normal to see good performance. 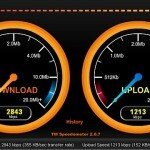 The real test will come when the network gets loaded with more and more customers. The speed and consistency of the Yes network, in the long run, will be dependent on their network and capacity planning to cater for user growth. 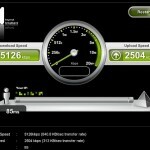 So to know if this new network is really good, we will have to wait and see. The tests that we’ve conducted in this first impression are just preliminary to test the basic performance of the network. 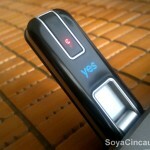 We’ll have a more thorough test at various locations soon to see if Yes does provide a consistent experience all-round. While we are doing this, please let us know if you have a question about the Yes network we’ll try to have it answered. Follow us on twitter at @soya_cincau on the latest updates. 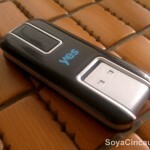 More pictures of the Yes GO USB modem and screenshots in the gallery below.